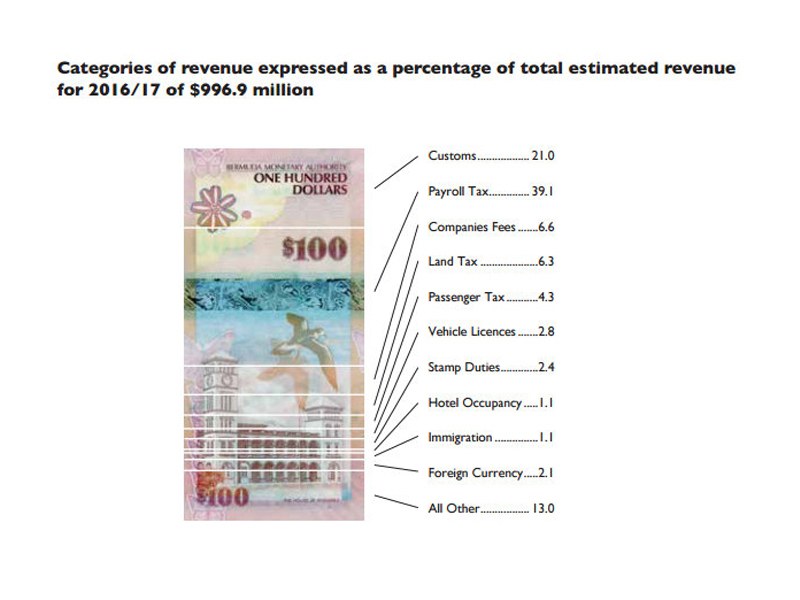 Payroll, alcohol, tobacco, gas and vehicles taxes will increase; Customs Duties will get simpler; and a tax on services were all part of the 2016-17 Budget Speech delivered by Finance Minister Bob Richards today. The speech, heavy laden with references to getting Bermuda out of debt and to a balanced budget by 2018-19, announced that the Great recession is over but Bermuda is not out of the danger zone yet. He said the deficit for the coming Budget is likely to be $199.4M, of which $150M will have to be borrowed from the Butterfield loan facility. The Budget is projected to be $1.196 billion for the 2016-17 financial year while revenues are projected to be $996.9 million. Mr. Richards emphasized that the debt has to be eliminated as servicing it is providing a strain on the Budget. “Debt service costs in FY2016/17 are projected at $187.4 million,” he said. Part of that is increasing the Government’s tax base by adding $150M in annual revenues over the next three years. Payroll tax will increase to 15.5% with the 1% increase split equally between the employer and employee. He added that there is “widespread and flagrant” abuse by people who are self-employed or principals in small business or professional practices with regard to taxes. A review will be conducted with a view of updating the tax code so they will pay their fair share but each case will be decided on its own merit based on data. In addition, Payroll Tax concessions for hiring new Bermudians will expire on March 31. Other Payroll Tax concessions to hotels, retail and restaurants will be rolled back over the next two years. Government plans to broaden the tax base by including services as well as goods. This new General Services Tax will be levied at 5%. Mr. Richards said it is estimated this new tax will generate $50M per year in revenue. Exemptions will be granted to the banking, insurance and health care industries. The tax on fuel will increase by 8 cents per litre starting in April and 5.5 cents for fuel imported by BELCO. 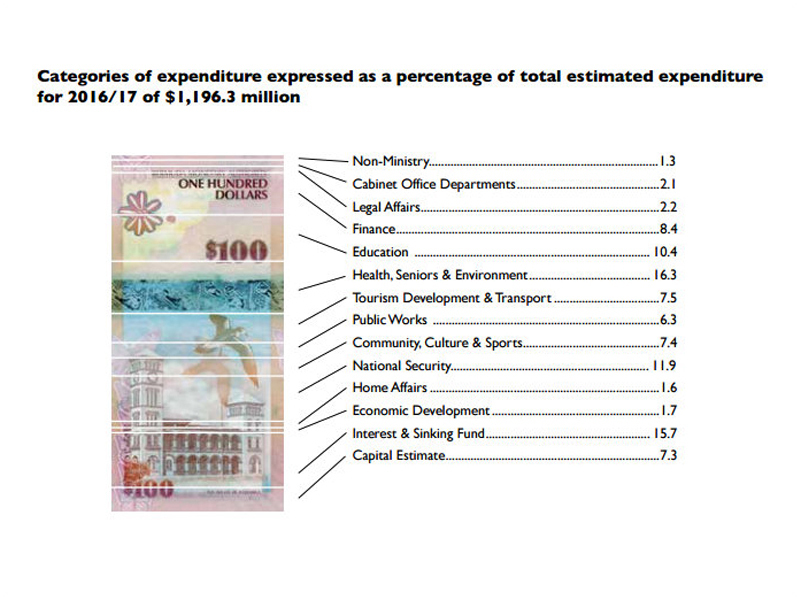 It is estimated that will increase Government’s revenue by $11.7M. Duty on tobacco and alcohol products will also be increased in April and is expected to raise an additional $4m in revenue. No specific price increases per type of product were mentioned. Government is expected to sell some of its excess property and anticipates $3M in receipts from these sales. Mr. Richards started his speech by saying even though the economy is in recovery mode not everyone is feeling its effects yet. He likened it to BELCO’s efforts after Hurricane Fabian in 2003. “BELCO swung into action to restore power throughout the Island. You could see linemen working overhead and underground, hour after hour, day after day and yet your power might still not have been restored. The Minister admitted that many people in Bermuda are still experiencing difficulties “because the restoration of the economy has not yet reached them. He pointed to several factors that the economy is growing including to GDP, a stabilized property market, increased planning permits and increased retail sales. Mr. Richards said those positive influences have not yet been felt in employment as that tends to be the one economic sector that lags behind the rest of the growth trends. He also added anecdotally many Bermudians who lost their jobs have become entrepreneurs and may not be captured in the Employment Survey. He expects the start of construction projects in the east end – The St. Regis Hotel and the L.F. Wade Airport redevelopment — to break ground this year and to provide a boost to the economy through constructions jobs and the America’s Cup to continue to provide increased employment to Bermuda. Mr. Richards said since April 2015, “Oracle, Artemis and Team Japan have established business operations in Bermuda with a cumulative spend of over $10.2 million to date for fiscal 2015/16. “This local spending excludes additional economic activity generated by the relocation to Bermuda of some 147 America’s Cup team employees along with their families, who have become fully integrated and are utilizing goods and services provided by restaurants, transport services, construction and trades, wholesale and retail operators, security services, marine services, shipping and forwarding companies, telecommunications providers, service industries, small businesses and real estate. The Finance Minister said Government is set to spend $24M in America’s Cup-related expenses for the coming 2016-17 fiscal year. 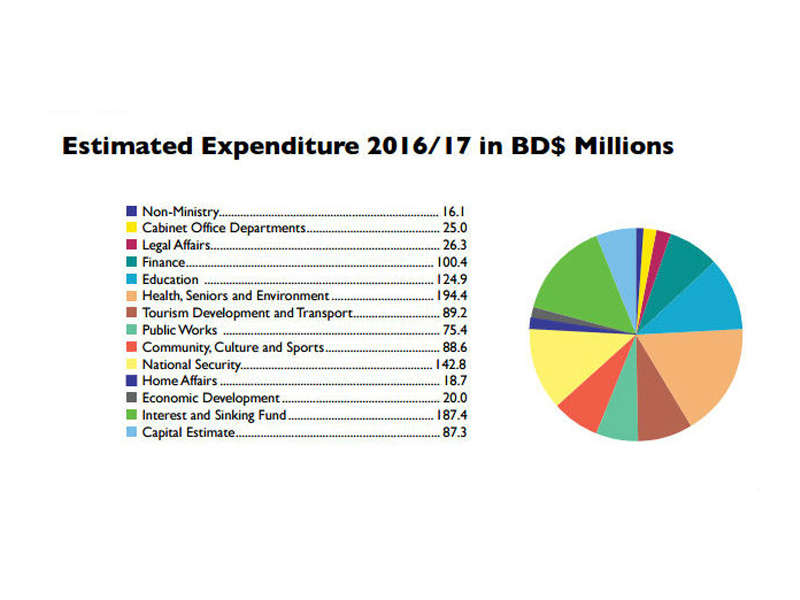 This includes $5M for sponsorship which has to be spent in Bermuda and $15M in capital spending on infrastructure. He said this would provide jobs, rents and incomes for Bermudians. Mr. Richards also pointed to 15 other major infrastructure plans such as the Causeway Bridge, Morgan’s Point, the airport redevelopment and St. Regis Hotel in St. George’s, as well as the AC projects, to provide a $1.88 billion economic stimulus to Bermuda over the next five years. Click here to view our live blog, and click here to view all our coverage of the 2016 Budget. A 5% sales tax is what it is we already pay duty on the parts at 33%. Now another layer of government interference and inefficieces. 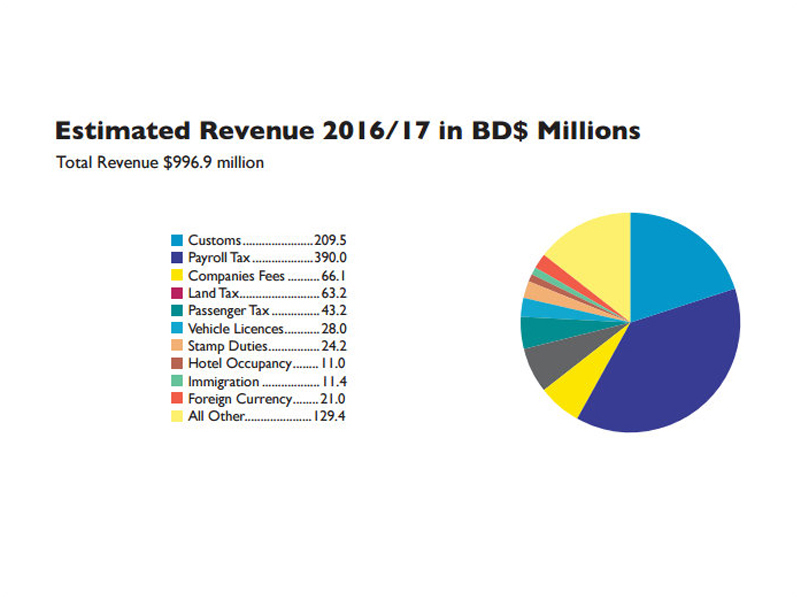 What’s the tax on services? VAT?